What’s the buzz today? Bees! Bees are so important in pollinating the many plants that feed us. 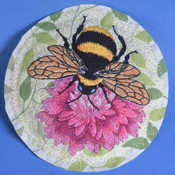 Bonus: crafts made with the images of bees are as sweet as honey. For example, there’s this beautiful fused glass dish by fancybutch. The yellow background makes this bee silhouette pop! Ludi stitched up this charming applique bee and flower piece, designed to be used on the back cover of a small art journal. 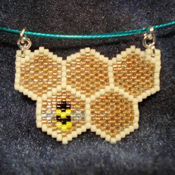 Onyxnox made this beautiful beaded peyote stitch pendant of a bee in its hive for a swap partner. She also included a matching pin. 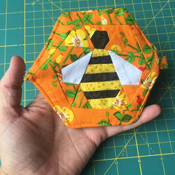 How cute is this hive shaped zippered pouch by HugsAreFun? What a fun way to keep your change in hand. 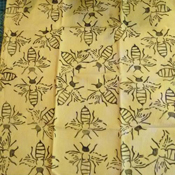 In honor of a hive of bees that has taken up residence in the eves of her house, edelC created some lino-stamped bee fabric. Be sure to check out her post to see her stamp on several different fabrics! She also include a few projects she made with the fabrics she made. Enjoy our friends the bees, and bee thankful for all they do. 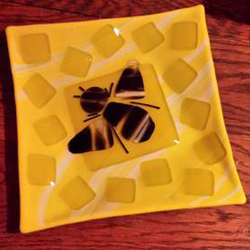 For more bee projects, click on the Craftster tag “bee“. Love all these projects! Craftsters are busy bees!